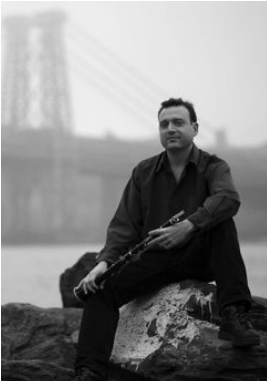 Grammy-nominated composer and clarinetist Derek Bermel has been widely hailed for his creativity, theatricality, and virtuosity. Artistic Director of the American Composers Orchestra at Carnegie Hall, Bermel is also Director of Copland House's emerging composers institute Cultivate, served as Composer-in-Residence at the Mannes College of Music, and enjoyed a four-year tenure as artist-in-residence at the Institute for Advanced Study (IAS) in Princeton. Bermel has become recognized as a dynamic and unconventional curator of concert series that spotlight the composer as performer. Alongside his international studies of ethnomusicology and orchestration, an ongoing engagement with other musical cultures has become part of the fabric and force of his compositional language, in which the human voice and its myriad inflections play a primary role. He has received commissions from the Pittsburgh, National, Saint Louis, and Pacific Symphonies, Los Angeles Philharmonic, Chamber Music Society of Lincoln Center, WNYC Radio, La Jolla Music Society, Seattle Chamber Music Festival, eighth blackbird, Guarneri String Quartet, Music from Copland House and Music from China, De Ereprijs (Netherlands), violinist Midori, and electric guitarist Wiek Hijmans among others. The Boston Globe wrote, "There doesn't seem to be anything that Bermel can't do with the clarinet." His many honors include the Alpert Award in the Arts, Rome Prize, Guggenheim and Fulbright Fellowships, American Music Center's Trailblazer Award, and an Academy Award from the American Academy of Arts and Letters; commissions from the Koussevitzky and Fromm Foundations, Meet the Composer, and Cary Trust; and residencies at Yaddo, Tanglewood, Aspen, Banff, Bellagio, Copland House, Sacatar, and Civitella Ranieri. His discography features three critically-acclaimed discs: an all-Bermel orchestral recording that includes the Grammy-nominated performance of his clarinet concerto Voices, (BMOP/sound); Soul Garden, his small ensemble/solo music (New World/CRI); and his most recent disc, Canzonas Americanas, with Alarm Will Sound (Cantaloupe). Bermel recently made his Cabrillo Festival debut, conducting his Dust Dances, and served as composer-in-residence at the Bowdoin Festival. Recent and upcoming are appearances or premieres include the Intimacy of Creativity Festival in Hong-Kong; the Seattle Chamber Music Festival; Hyllos, his evening-length collaboration with The Veenfabriek and Asko | Schönberg Ensemble, which premiered the Netherlands; performances and recordings with the JACK quartet and Music from Copland House ensemble; and as soloist with the New Century Chamber Orchestra.